After a long time of constant distraction by my daily work, I finally found again a bit time to take care of KTextEditor/Kate/… issues. One thing that really started to be an itch I wanted to scratch is some rendering fault that occur with ‘special’ font sizes. I tried to track down where in our rendering in KTextEditor we do create these artifacts, but I never found any place that looks like a possible cause. After a bit more tinkering it became obvious that actually it would be more or less impossible for the KTextEditor code to mess up the painting in such a way, as we normally draw one line more or less as one thing using QTextLayout that handles the painting of the selection background, too. :=) Good thing that Qt is open source. A quick look into the qtextlayout.cpp and a qt5 compile later, I was able to trace the issue down to some qFloor calls for painting the selections. I hope my patch is correct and will be accepted (QTBUG-66036 / Gerrit 219804) or at least helps others to do the correct fix. At least for the syntaxhighlighter example shipped with Qt I was able to reproduce the issue before my patch but not afterwards. 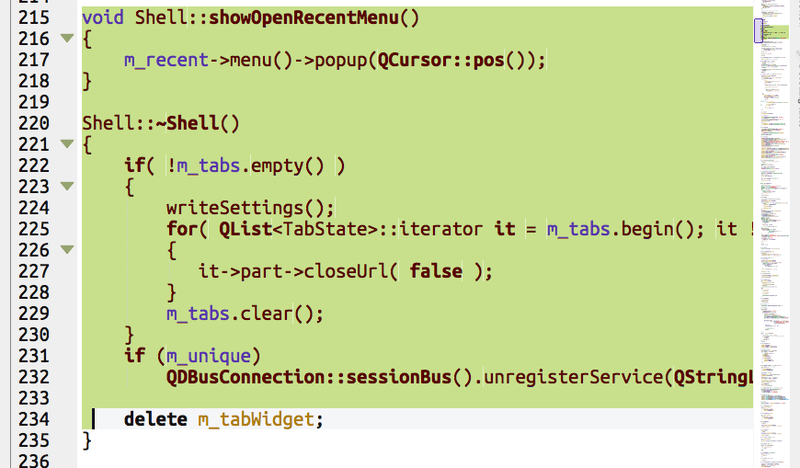 Would Qt not be open-source, I would have been at the end of the line after seeing no “error” in our codebase in KTextEditor. With Qt as some open-source project, it is a completely different story. Besides, the Qt documentation for “how to build it” and “how to contribute” on the Qt Wiki are well enough to understand that I was able to nicely compile the stuff from scratch on macOS and provide the Gerrit review request in no time. Great that you started digging into those tiny rendering issues that seem to have their roots in Qt itself. There is a long standing bug that is similar to above which leads to automatic spellchecking to “appear” disabled in all KTextEditor applications on systems using bigger font sizes, e.g. high-dpi systems. See this bug https://bugs.kde.org/show_bug.cgi?id=376565 and its related issue that goes back to font rendering and baseline heights. Would it be possible to revisit those issues? Currently spellchecking marks are absent on any high-dpi system (rendering the feature unusable) which makes Kate and Kmail lacking an important helper for text writing. Thanks for your work on Kate!